All of us at Tender Beginnings Birth Services, love our clients and care about them far past their birth with us. In keeping with our feelings, one of our assistants, Jessica Caldwell created this blog post. Jessica is more than just an assistant here but, a mother of six, and a doula in her own rite. Nearly every new mother experiences emotional ups and downs during the 2 weeks following birth. The intense hormonal shift that occurs after delivery, combined with the challenges of a new routine can lead to symptoms of “baby blues”. These symptoms include sadness, crying at unpredictable times, irritability or mood swings, being overly worried about the baby, and having difficulty sleeping. Baby Blues tends to resolve within a few weeks, with rest, postpartum support from family members, and with the regulation of the mother’s milk supply. 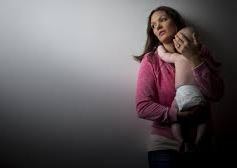 Postpartum Depression and other Perinatal Mood Disorders occur less frequently, in only 15-20% of cases. It can show up during pregnancy, and reemerge anytime during the year following birth, lasting much longer than the Baby Blues phase. Family and friends may notice the mother not acting like her normal self, a change in maternal eating and sleeping habits (too much or too little). The mother may have racing thoughts, or experience feelings of anxiety, shame, or hopelessness. Loss of interest in the infant, or thoughts that the infant would be better off in the care of another are indicators of PPD. Some mothers may express a desire for isolation, or turn to a compulsive need for order in the form of cleaning, counting, or rechecking things. Mothers who may be experiencing postpartum depression should know they are not alone, and it is not their fault for feeling how they do. These feelings are temporary and totally treatable. The first step in navigating PPD is asking for help from a trusted friend, or care provider, who can listen compassionately to these feelings. ← Yes! There are Benefits to Water Birth,…Let’s avoid a C-Section, episiotomies, epidurals and Pitocin…..